Histological techniques 5. General staining. Atlas of plant and animal histology. Most tissues, specially animal tissues, are colorless. Dyes are colored substances with affinity for specific molecules of tissues, so they get attached to the tissue and provide color. Staining is the process for coloring tissues by using dyes. It allows visualizing cells and extracellular matrix to be studied with light microscopes. Staining is usually done on tissue sections and cell smears. The most common sections for staining are those obtained from paraffin embedding and frozen tissues. 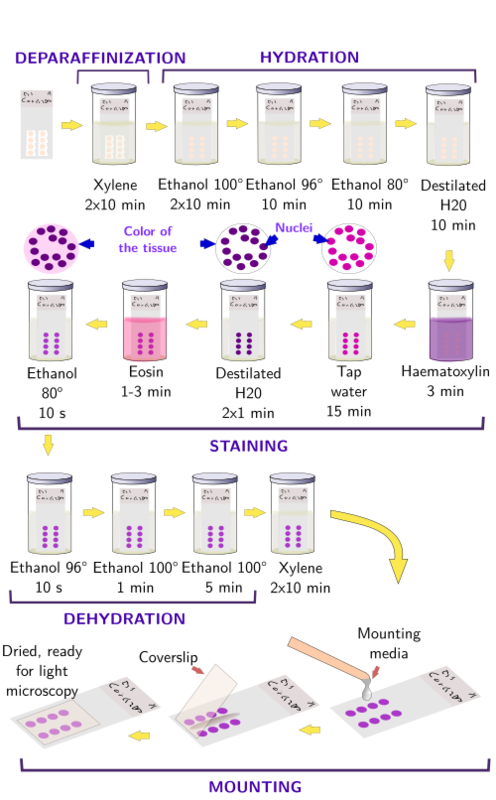 Dyes are the main components of the general staining protocols performed in histology labs. A dye molecule has two domains: the chromogen provides the color and the auxochrome makes possible the binding to the tissue. Chromophore is the molecular structure of the chromogen that absorbs a particular light wavelength. The auxochrome may affect the final color and some dyes have more than one auxochrome group. Auxochromes are chemically variable: can be ionizable, can react with metallic ions (they are then called mordant), or can react with tissular molecules. Most dyes are hydrosoluble. Some dyes that have no ionizable groups are useful for the staining of fat, like lipid droplets. Dyes can be classified considering the chemicall composition of the the chromophore: nitro dyes, azo dyes, anthroquinone derivates, quinone imine derivates, acridine derivates, deferril methane and triferril methane derivates, xanthene derivates and phthalocyanine derivates. Basic dyes. They are salts where the base, usually an amine group, provides the color, whereas the acid is colorless. That is, they are cationic dyes. They have affinity for acid substances like DNA and some compounds of the extracellular matrix like glycosominoglycans. These dyes bind to the tissue by electrical forces. They are commonly used to stain nuclei, ARN, mostly the abundant ribosomal RNA, as well as some extracellular matrices rich in acid molecules. Thionin, saphranin, toluidin blue, methylene blue and haematoxylin (hematein) are examples of basic dyes. Acid dyes. They are salts with a colored anion and a colorless base, derived from sulfonic, carboxyl and phenolic hydroxyl groups. They have affinity for basic substances, mostly cytoplasmic proteins and collagen of the extracellular matrix. They bind to tissues by electrical attraction . Acid fuchsin, fast green, orange G and eosin are examples of acid dyes. Mordant dyes. They are dyes that need the help of metallic salts to be effective dyes. Metallic salts can be used before, during or after the dye. Mordant dyes may be anionic or, less frequently, cationic. They are commonly used for nuclear staining. Heidenhain ferric haematoxylin is a mordant dye. Neutral dyes. The basic and acid parts can both provide color. Thus, the same dye can stain acid and basic structures of the tissue. Eosin-methylen blue is an example of neutral dye. Hydrophobic dyes. They do not bind to tissues by electrical affinity. They are actually dissolved in tissular compounds. For instance, Sudan dyes are dissolved in fat, and therefor it stains cellular lipid droplets, clearly visible in adipocytes. In histology, dyes are used in very high concentration and the tissues are really small samples. That is why staining solutions can be used many times before their staining capability decreases. There are two ways of staining: progressive and regressive. During progressive staining, as long the tissue is in contact with the dye the intensity of the staining (the intensity of the color) increases. Thus, a proper intensity is acomplished controlling the dye concentration ant staining time. In regressive staining, there is first a saturation of the stain, i.e., no more dye can be got by the section, and then there is a discoloration process. Decreasing the intensity of the staining is usually achieved with alcoholic solutions, so the desired staining intensity can be got controlling the concentration of the alcoholic solution and discoloration time. When several tissular structures have to be deferentially stained, it is common to use staining procedures containing several dyes that bind specifically to particular cell types or component of the extracellular matrix. For example, the Mallory's trichome stains collagen in green and muscle cells in red, by using aniline blue, acid fuchsin, and orange G.
Metachromasia is a property of some dyes that are able to change their color when they are bound to the tissue compared with the color they have in solution. It happens when the light absorption of the dye changes after the binding to tissular components. For example, toluidine blue can give blue, green and purple colors depending on which molecules it is attached to. Ortochromasia is when the color of the dye is the same in the tissue and in solution. General stanining. The haetamoxylin-eosin histological technique is probably the most used staining procedure for paraffin sections (Figures 1 and 2). Haematoxylin (haematein) stains acid substances and eosin the basic compounds of the tissue. Before the staining, sections should be treated for removing paraffin and hydrated because both dyes are hydrosoluble. These processes are not needed for cryostat frozen sections. Figure 1. 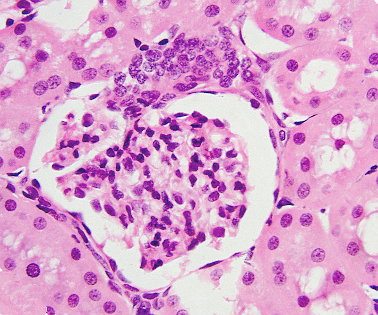 Haematoxylin-eosin staining of a glomerulus of a kidney. It is a paraffin section. Nuclei are purple-bluish (haematoxylin) and cytoplasms are pink (eosin). Figure 2. Haematoxylin-eosin staining. The time in each step is variable depending on the sample and concentration of dyes. Deparaffinization removes paraffin. Tap water differentiates haematoxylin, which means that excess and non-specific haematoxylin is removed and the color changes to get a final purple-violet color. Dehydration is needed for the non-hydrosoluble mounting media. Mounting media do not affect color nor tissue features, and have excellent optic properties. Furthermore, they preserve the samples for years. After mounting and drying (xylene is evaporated), sections can be observed at light microscopy. Semithin section staining. Before getting sections for transmission electron microscopy, it is advisable to have an idea about the region of the tissue to be studied. Transmission electron microscopy sections have a very small surface, so only a small portion of the sample is included in one section. That is why it is common to get a semithin section (about 0,5 µm in thickness) having a much larger area, to be visualized at light microscopy. With the help of this image a very small area of interest can be selected for ultrathin sections. Semithin sections are stained with toluidine blue, which can go through the resin (embedding medium) when applied at high temperature (Figures 3 and 4). Figure 3. 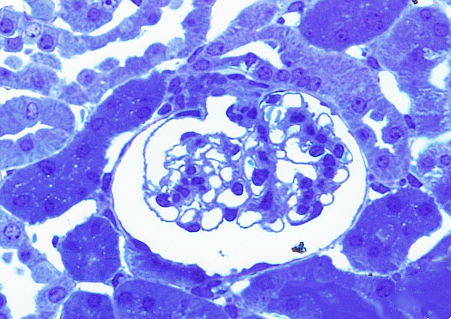 Semithin section of a kidney glomerulus stained with toluidin blue. The embedding medium (Durcupam resin) has not being removed. Figure 4. Staining of semithin sections with tolouidin blue. Resin porosity allows the dye to reach the tissue. There is no need for removing the resin. Contrast of ultrathin sections. Although ultrathin sections can be observed at transmission electron microscopy without any treatment, they are routinely treated with heavy metals for optimal visualizing of ultrastructures, procedure known as contrast (Figures 5 and 6). Contrast is not a staining because it does not provide color, but it is commonly used for studying cell ultrastructure. That is why we are dealing with it in this page. It must be stressed that electron microscopy do not need dyes but molecules interfering with electrons emitted by the electron microscope and crossing the ultrathin section. After the contrast, heavy metals that remain in the tissue prevent the electrons to go through the section. Electrons that are able to cross the section can impact onto a fluorescent screen. In this way, dark areas, lines or points in the screen mean areas, lines or points in the tissue with heavy metals. Since electrons impact onto a fluorescent screen, all the original electron microscopy images are in gray scale, from white to black. Figure 5. Contrast of ultrathin sections. Time in uranyl acetate and citrate lead may change. Sodium hydroxide decreases the air moisture for preventing the precipitation of lead. 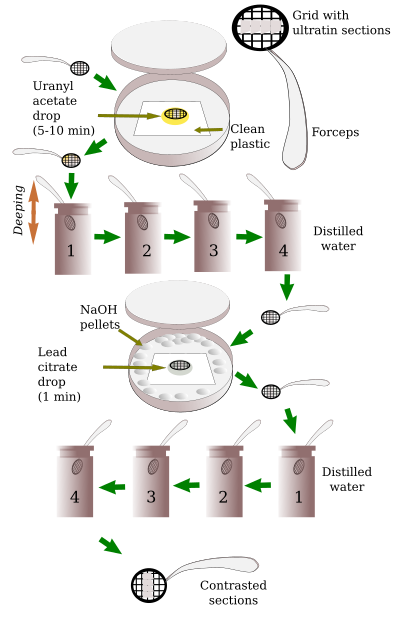 Washing in distilled water are by several fast immersions in each distilled water step. It is known as deeping. Figure 6. Transmission electron microscopy images. The dark structures correspond to heavy metal present in the section. The intensity of gray correlates with the amount heavy metals.